Is Folkstyle good for Freestyle? After I realized that 7 of 8 of this years world team members had made the US team within a year of graduating college I really wondered if there was something more to this. So what I decided to do was a very unprofessional statistical analysis of the US Teams performance vs when they graduated college. What I looked for was when was an athletes best WTT performance vs when did he graduate college? The results were stunning, 23 of the 32 wrestlers who placed top 4 at this years WTT had their best WTT finish within a year of graduation college. As I will detail in a video blog to go along with this post very few of these guys improved after focusing exclusively on freestyle after their collegiate careers. I don’t know what the answer is to this equation. Maybe it is that when men graduate college their are at their physical peaks, maybe they get scouted, maybe the freestyle training system is failing our athletes, maybe guys get lazy when they get off the college grind. The next thing I looked at was how many guys who have made multiple US teams have improved upon their finishes at the World Championships. 6(Ramos, Metcalf, Burroughs, Herbert, Bergman and Dlagnev) of the 8 guys(Ramos, Humphrey, Metcalf, Burroughs, Herbert, Varner, Bergman, and Dlagnev) had their best finish on their first try at the WC’s. For 5 of them this came within 1 year of wrestling their last collegiate match. So this got me thinking, why aren’t guys improving? Is the grind of the folkstyle season what it takes to keep the mind and body strong? I don’t have answer, so maybe you can give me some!!! https://awawisconsin.com/wp-content/uploads/2019/01/askren-wrestling-academy-wisconsin-logo.png 0 0 Ben Askren https://awawisconsin.com/wp-content/uploads/2019/01/askren-wrestling-academy-wisconsin-logo.png Ben Askren2015-09-24 01:46:092015-09-24 01:49:59Is Folkstyle good for Freestyle? You hit it in your conclusion. The grind of the college season is paramount. Ben, I’ll remind you, the greats like John Smith, Kenny Monday, KJ, a Bruce. Zeke… They all competed at a time prior to Regional Training Cites and the support of the USOTR. They stuck around Colkege Teams, then after workouts they would form a circle and do about 15 min of par tere. That was it. The results are undeniable. Also, our guys just out of college are not as heavily scouted. After they have seen us compete, they generally know to stay away from the one or two shots Amercians tend to have. Metcalf (lefty high crotch), Herbert (single). We do not score in as wide a variety of ways as other countries. I think the amount of matches and competition makes a difference. The Europeans all have easier access to regular high level competition in freestyle. American college wrestlers are constantly exposed to competition and have to maintain weight all the time. That crucible of discipline and being ready to compete all the time probably keeps them sharp and constantly learning. We can practice in the room all we want, but there has to be the real life test of what we work on in the room – thus the importance of “staying busy”. Look at James Green’s path. Arguably the busiest and most challenging road to the World Championships, but he did amazing. We have fallen way behind the world in free and greco, because we do folkstyle.I love folk style but the rest of the world trains only two styles year round. We only truely start after college, and tring to catch up is truely very hard, this is my opinion which may not be worth much, but i love to give it anyway. It’s not like the USA guys are getting outclassed. The matches are generally close and as Ben points out there is a slow decline in where they finish/place. I don’t know the guys like Ben does and when he said today that he believes they are doing, or willing to do, everything necessary to win it made me rethink my feelings on this issue. I’m still going to go out on a limb and propose that it might be mental. Now, there are an infinite number of things that can influence an athletes mental focus and preparation but the ones that may change over time from college might be focus and confidence. Life gets more and more complicated the older you get (family, finances, coaching, etc.) and you are no longer free from distractions and able to focus 100% on wrestling. Confidence is tricky. Jordan Burroughs still has the bullet-proof confidence of a guy who hasn’t learned he can lose. That is rare. Learning you can lose and losing more regularly does effect people and it takes a lot of work to remain confident, relaxed, and perform at your best if you are worried, or even thinking, about losing. Maybe the foreign guys deal with more adversity (losing) throughout their careers and have learned to adapt their psychology better. Again, our guys are only a step behind and he decline is slight so the cause is likely not as obvious as the style of wrestling they practiced last year. My thoughts. It really boils down to the strength of the attack and whether it is relatively strong compared to other wrestlers in the weight and whether it can be adjusted for. This dynamic is very real despite the small sampling. Case studies are provide good examples. Stephen Neal provides a great example. World Champ in ’99, but Kerry McCoy was able to adjust for his double leg attack. Some wrestlers attacks are based on explosive attacks which are near impossible to defend like Burroughs, Igali and Snyder. 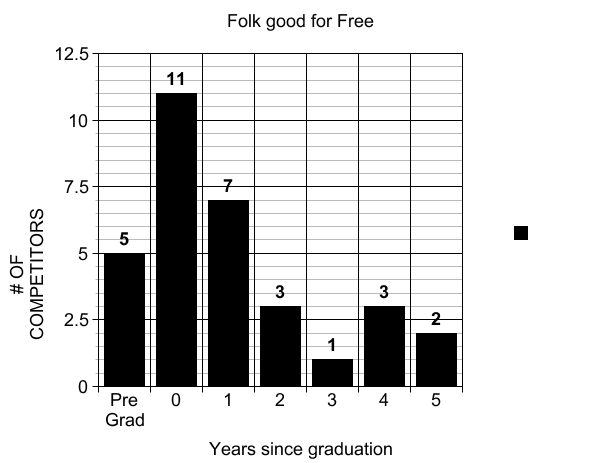 Regarding college folk style, it is a correlation whereas the true variable is age. With the appropriate attack and training someone as young as 19 can win. I posted the analysis below on the FRL page, but wanted to address what you have provided in this blog. The major flaw that I see in your analysis and conclusion has to do with how you have defined success. While your analysis indicates the most success in the WTT comes within a year of college graduation, it does not address the strikingly discordant results that we see from the United States’ Sr Men’s Freestyle World and Olympic championships. If we define success as winning World and Olympic medals then we see that for an overwhelming majority of US Sr Men’s freestyle wrestlers it takes at least one year out of college to win a World or Olympic medal. If we define success by how well US Sr Men’s freestyle wrestlers fare domestically then there is solid evidence to support the collegiate system and folkstyle. However, if we define success as winning World and Olympic medals then a very strong argument can be made in favor of having a freestyle based system. I argue below that the extremely low numbers of US Jr Men’s freestyle world medalists who go on to medal in the Sr Men’s freestyle World and Olympics might be a product of the overemphasis of folkstyle for male wrestlers in the country aged 18 to 20 years old. Much debate has occurred regarding the United States and its utilization of folkstyle youth and collegiate wrestling. Wille Saylor and his ilk have trumpeted the call that the United States’ overemphasis on folkstyle wrestling has impacted how well the country’s men’s senior (Sr) freestyle wrestlers perform internationally. This assumption has been challenged by Christian Pyles, Ben Askren, and TR Foley with assertions that the rigors of the country’s collegiate system prepares its Men’s Sr freestyle wrestlers to perform successfully. Ben Askren provides data which indicates that the United States wrestlers are the most successful in Sr men’s freestyle immediately after they conclude or while they are still in the collegiate ranks. However, it appears this data focuses on their initial placement in the World or Olympic championships without regard to whether or not they medaled. @bondservant rebukes Askren stating that “[o]ver 80% of all of our world/olympic medalists in the last 20 years needed at least one full year of freestyle training to medal.” To follow is an attempted analysis which probes the relationship between medaling at the junior (Jr) Men’s Freestyle World Championships and Sr Men’s Freestyle World and Olympic championships. The United World Wrestling Database contains information on Jr Men’s Freestyle World medalists and Sr Men’s Freestyle World and Olympic medalists. For the purposes of this analysis data was probed from 2000 to 2015. In that time frame there have been 59 wrestlers that won a Jr Men’s Freestyle World medal and also won a Sr Men’s Freestyle World or Olympic Medal. Russia had 24 of their 74 Jr Men’s Freestyle World medalists that went on to win a Sr Men’s World or Olympic Medal. Whereas, the United States had 2 of their 27 Jr Men’s Freestyle World medalists that went on to win a Sr Men’s World or Olympic Medal. The following analysis can be viewed as a simple case-control study. A 2×2 table was utilized to calculate an odds ratio between the aforementioned countries. The null hypothesis was that the odds ratio is 1 (i.e., no significant difference between Russian Jr World Medalists winning Sr World or Olympic medals compared to United States Jr World medalists). The results indicated that from 2000 to 2015 the odds of winning Sr Men’s Freestyle World or Olympic medals was 6 times higher for Russian wrestlers that won a Jr Men’s Freestyle World medal compared to United States wrestlers that won a Jr Men’s Freestyle World medal. This analysis yielded a statistically significant p-value of 0.0209. The 95% confidence interval (95% CI) was 1.3119 to 27.4420. This analysis yielded a statistically significant p-value. Therefore, the null hypothesis is rejected. It should be noted that the 95% CI is rather wide, which is due to the small sample size. A larger sample will should garner a more narrow 95% CI, which will likely lead to a more precise and lower odds ratio. Sample size is an issue regarding the precision of the odds ratio that was yielded in the analysis. However, a simple eyeball test of the numbers indicates that Russian medalists in the Jr Men’s Freestyle World Championships are much more likely to see success in the Sr Men’s World and Olympic Championships than their United States counterparts. An important take away from this analysis is with regards to the age level of the Jr ranks (i.e., 18 to 20 year olds). An argument can be made that United States wrestlers in the Jr age group are likely focusing all if not most of their training and competition in folkstyle as opposed to the international styles. This may have an adverse effect on how well they perform in the Jr Men’s World Championships. There is an interesting side note regarding the two wrestlers from the United States that won medals in the Jr Men’s World Championships and also won medals in Sr Men’s World or Olympic Championships. Those two wrestlers are Henry Cejudo and Kyle Synder. Henry Cejudo opted to forego wrestling in college to focus his training and competition in freestyle wrestling and Kyle Synder opted to forego his senior year in high school to focus on freestyle training and competition. While these two wrestlers are outliers their paths to success are similar. Youth and college age male wrestlers in the United States focusing primarily on freestyle wrestling might be a manner in which the United States witnesses heightened success in Men’s Freestyle wrestling at the World and Olympic championships. WOW jtrosalez that is an awesome analysis!!! I appreciate and I more wanted to start the discussion than draw a conclusion. Thanks for the feedback. No problem man. This topic of free vs. folk sure does bring about some lively debate. IMHO I would be totally shocked if the NCAA ever decided to transition to freestyle wrestling. Seems too much like a good old boys club that likes to maintain the status quo. Although a switch to free might add women’s wrestling to the NCAA and that could open the door for more men’s programs. Also from an MMA perspective I see more benefits to folk as it promotes mat wrestling fundamentals sans the “stay off your back!” mentality. Good luck in your Do Over match against Santos!